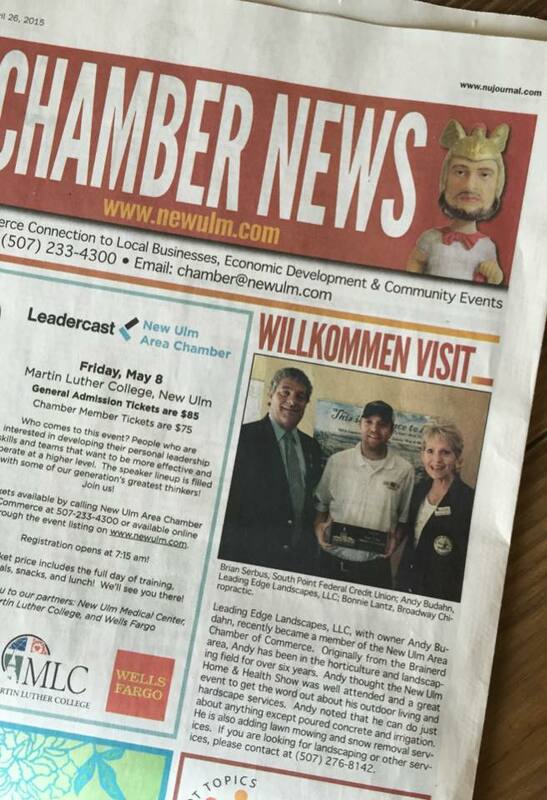 Leading Edge Landscapes is now part of the New Ulm Area Chamber of Commerce! We were featured in The Chamber News. This is what the Chamber said, “Originally from the New Ulm area, Andy earned his horticulture degree in Brainerd and has been in the horticulture and landscaping field for over six years. Andy thought the New Ulm Home & Health Show was well attended and a great event to get the word out about his outdoor living and hardscape services. Andy noted that he can do just about anything (see what we offer for more information). He is also adding lawn mowing and snow removal services.” See our listing here. We are excited to be a part of the Chamber and look forward to serving the New Ulm area. If you are looking for landscaping or other services, please contact us at 507-276-8142.